FORT LAUDERDALE, Fla. – As hurricanes and tropical storms spin in the Atlantic Ocean, now is a great time to consider how to be proactive about avoiding danger following a storm. Here’s one: Prevent carbon monoxide poisoning. Tragically, a few Floridians die from CO gas almost every time a storm or an emergency knocks out power. Why? Because of mistakes using portable generators and emergency cooking and heating devices. On average, 438 Americans die every year from CO, the colorless, odorless and tasteless “silent killer” emitted by incomplete combustion of fossil fuels. But CO poisonings are easily preventable. 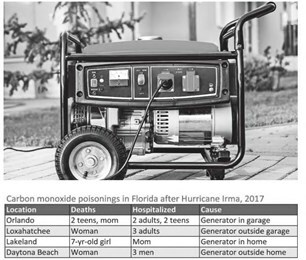 Here are four ways to stay safe, from the U.S. Consumer Product Safety Commission and Florida Department of Health: Generators – Never run a portable generator inside the house, garage or any enclosed area. Keep them at least 20 feet from any door, window, vent or car so fumes do not seep inside. If a neighbor is using a generator, make sure it’s not too close to your home. Example: After Hurricane Irma last year, at least six Floridians died – including a mom, two teens and a seven-year-old – from generators running in or near the home. At least 60 others were hospitalized from generator CO fumes. Many people set up generators close in fear they will be stolen. Instead, protect it by chaining it, putting it inside a locked fence (with wheels removed) or bolting a metal plate on the bottom and parking the car on the plate. Grills, BBQs, etc. – Never cook with fossil fuel (propane gas, charcoal, kerosene, etc.) inside an enclosed area. Like generators, keep them at least 20 feet away from openings to the house or car. Example: After Irma passed, a family of eight in Lauderdale Lakes was hospitalized after their stove broke and they set up a makeshift charcoal cooker in the house using an old metal car wheel. Heating – Never use a gas stove to heat the home. It can emit deadly CO for hours undetected, or the flame can go out by mistake and quickly fill the home with natural gas. CO detectors – For your family’s safety, install a carbon monoxide detector outside every sleeping area, and on every floor. Models start at $20; combination smoke / CO detectors start at $30. Models run by batteries, plugging into a wall socket with a battery backup, wired to electricity with a battery backup, or powered by a 10-year lithium battery. In all cases, test the units and/or batteries yearly. Learn more safety information at Consumer Protect Safety Commission, www.cpsc.gov/Safety-Education/Safety-Education-Centers/Carbon-Monoxide-Infor- mation-Center; Florida Department of Health, www.floridahealth.gov/environmental-health/carbon-monoxidel Centers for Disease Control & Prevention, www.cdc.gov/co. Bob LaMendola works in the Community Affairs division of the Florida Department of Health in Broward County.